The Edinburgh Zoo Panda Tartan was designed by Kinloch Anderson for The Royal Zoological Society of Scotland. The RZSS was formally established on the 18th of March 1909, by Edinburgh lawyer, Thomas Gillespie. In light of this and to give the design a direct link to The Edinburgh Zoo's heritage, the Gillespie Tartan was chosen as the starting point for the new design. The main colours of the tartan are black and white for a direct representation of the Pandas with added grey shades to soften the Tartan as well as to convey the gradation of colour from black to white, as seen on the Panda's fur. Red is also an important colour within the design as it represents China and the wonderful gift they have given to Scotland. The number 3 signifies luck due to the fact that it sounds similar to the Chinese character for birth. Where possible three red overchecks have been added into the heart of the design. This shows China, as well as the Pandas, are now in the hearts and minds of Scotland and its people. In places an additional colour of green has been added to represent the Pandas nourishment of Bamboo. 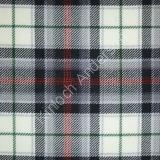 This officially registered tartan has been designed by Kinloch Anderson for the exclusive use of The Edinburgh Zoo and Kinloch Anderson. Use or sales by other companies is strictly prohibited.